Engineer-crafted companion. I hope he looks like Sam. That's a pretty realistic robot. Pretty soon, engineers are gonna be able to craft replacement raid members. The curent View in 3D is wrong, but the screeshot from perculia is correct. Glad they fixed the icon! 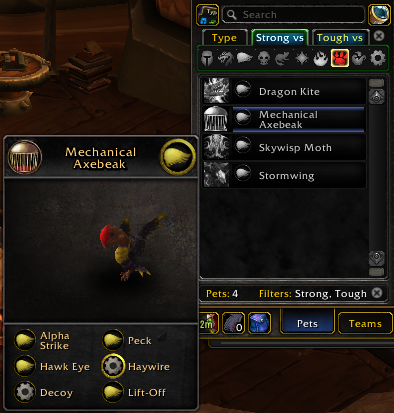 It's now a cage, but it was the icon from Mechanical Pandaren Dragonling. Shocking discovery! This is the only "mechanical" pet that isn't mechanical type! One of only 4 battle pets that is both Strong and Tough against Beast types! Handy against the Garrison Pet Daily "Rukus and Brutus" among many others! Very cheap to make, and one of the few pets with both defense against Beast damage as well as a good attack against Beasts (Haywire) -- plus has Decoy to survive those big attacks or carry a level 1 pet. Pair with a Skywisp Moth (tamable for free on Timeless Isle) which has Call Lightning (25% bonus to Mechanical attacks --i.e. Haywire) as well as good defense against Beast damage and you have a great beast killing team.